In need of some creative gift wrapping ideas? Here are just a few to spark your creative mind. Whether you are wrapping a birthday gift, Christmas gift or wedding gift, ] you can use the ideas below and modify them for your own personal gift wrapping. For example, for baby gift wrapping, you just have to use baby images from cliparts or rubber stamp designs. Baby shakers, diapers, safety pin, or other baby toys will be appropriate for the gift wrap. 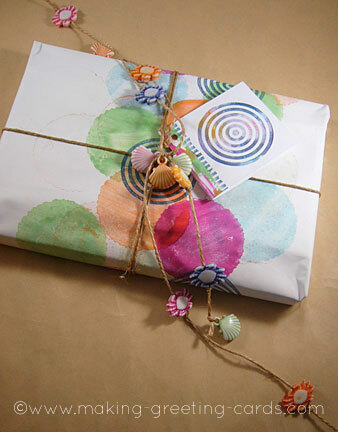 For this birthday gift wrapping, just use a sheet of plain white paper or newsprint paper. 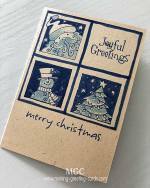 The images on the paper are rubber stamping done with a All Night Media wood mounted stamp. Because it's a birthday gift for a 8 year old boy, I used bright colours; blue, magenta, orange, and green. 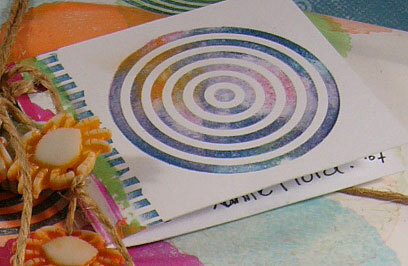 I over-stamped in navy blue with a Hero Arts wood mounted stamp: Small Concentric Circles. 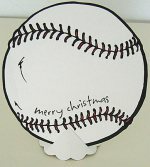 Note: Before stamping, you need to roughly wrap the gift to get an idea where the design will go. Mark lightly with a pencil. Unwrap and stamp. After wrapping, I threaded some bright colour beads with the strings, tying knots at interval so that the beads will not move. Finally, attach the gift card to it. Below is a picture of the gift card attached to the handmade printed wrapped parcel. 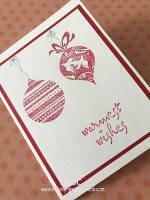 And here's another gift note card and gift wrapping using an ordinary copy paper or white mah-jong paper and rubber stamps. For a small gift, like this dog charm pendant, I used the gift to decorate the birthday card. See picture below. The birthday card is inside the triangle envelope. 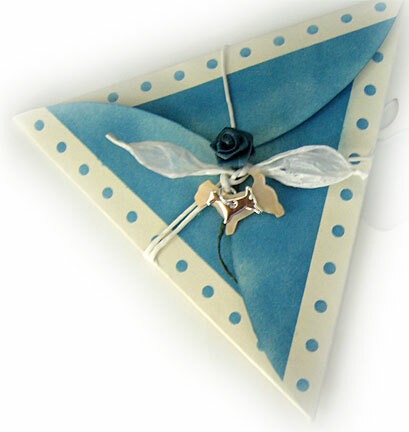 Just a simple folded cream colour triangle card with the words 'Happy Birthday' stamped in matching blue. For gift wrapping ideas for decorating boxes, the below wrapping idea might be the answer. For this, all I did is to decorate a scored strip of card stock with snowflakes images then use double-sided tape to attach the end flaps then slip the box into it. 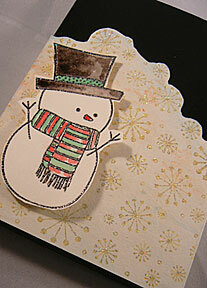 Finally, a snowman stamped and coloured and attached to the front with foam tape for a 3D effect. 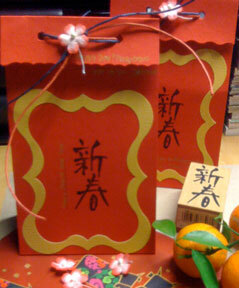 And here a red paper bag for a red festival - Chinese New Year. This is a red paper bag made using a template created from a shopping bag. A paper bag is the best gift wrapping idea for any shape gifts especially small items like sweets. 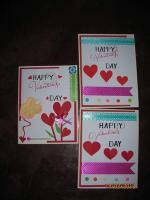 You can get card-making ideas anywhere. Just look at the things around you; whether at home, at your working place or on the street. Here's an idea for a greeting card from a pair of shoes I have. 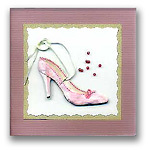 Click here to read instructions for making this shoe card.